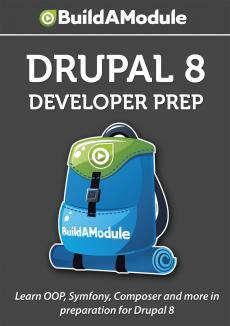 Early on in this series, we created a "controller" inside of our Drupal 8 module. If you've never worked with object-oriented code before, you might be a little confused about what the role of a controller is. No problem, here we make it simple and explore an example in our code. Now, we have just naturally sort of bumped into the concept of a controller. You may have heard of the idea of model-view-controller or MVC and in the Symfony framework, which we'll talk about more later, there is the idea of a controller as well. That controller is exactly what we generated in our Drupal 8 module in order to render the content on our page. Now, the basic idea of a controller is that it's sort of an intermediary between the data and the tool to display that data. And in the controller, you might end up performing some logic on that data or reorganizing it in such a way to send it to the tools that output it. Now, naturally, we've structured our code just like a controller would work. We have isolated out the data into these arrays, and that's the model part of model-view-controller. This is modeling the data. And then for the view part, we have this page build function and page theme. Those process the data and make it something viewable. And this bit of data right here is the controller. It's the thing that glues the two together. So, we're going to move it into its own class to more mimic the structure that we're going to see in Drupal and that we would see in Symfony and a lot of other object-oriented projects as well. So, let's jump back to the file browser and we'll open up the sixth step which is called adding a controller. Copy the entire code and paste it over the code in your index dot php file and save it. Now, just a quick reminder. If we go back to the file browser, right now we are in the oop directory of the examples folder in our Drupal root directory and this is where we're doing these examples. So far, we've had just an index dot php file.